I’ve not done a lot of ribs over the years, but I have done some. I’ve done enough to learn three things that are very important keys to yummy, fall-off-the-bone, mess-all-over-your-fingers-and-face Dutch oven ribs. They are: First, a good spice rub. This lays the foundation of seasoning and flavor for your ribs. Gotta have it. Second: a good barbecue sauce. This is the second layer. There are as many ways to make a good sauce as there are people cooking, so you really have to try to go wrong. Each sauce brings its own nuances and subtleties. Tangy? Sweet? Sticky? Sloppy? Hot? Fruity? You can adjust it to your hearts content. Finally: a long cook time. Cooking the ribs until they’re at the government recommended temperature for “doneness” and safety isn’t gonna cut it. Yeah, it’ll taste good, but you’ll have to gnaw it all off the bone instead of just letting it fall off. You’ve got to cook it well past “done” to get to that point. Fortunately, doing that in a Dutch oven won’t dry out the meat, because the moisture will be trapped under the heavy lid. One other thing I have to say about this: Sometimes, cooking is like playing classical music. I pay really close attention to the recipe and I measure out the spices and ingredients, as if I were reading the music note-for-note. Other times, a good meal should be like a good jazz tune. You have a lead sheet with the melody and the chord structure, but it’s not so much notes as it is guidelines. You really make it up as you go, and you never play the same song the same way twice. This last time I made these ribs, a couple of weeks ago, it was a great jazz jam! As I said, this is more improvised jazz than it is formalized classical. The recipes above are for my traditional spice rub and my own barbecue sauce. I was out of the spice rub, and I was feeling a bit minimal this time, so I just went back to basics: Salt, black pepper, paprika, and garlic powder with just a bit of chili powder. All of the other flavors are great, too. Just do what you want! I opened the ribs package and cut them into chunks of about 4 ribs each. That’s the only way you’ll get them into the Dutch oven. I rubbed the spices over the surfaces (both sides), covered them with plastic wrap, and put them on a baking pan in the fridge. While that was chilling and soaking in the flavors, I lit up the coals. I lightly oiled the inside of the Dutch oven. I don’t know that it was really necessary, but I did anyway. A lot of the fat from the ribs will render out anyway. Then I set the rib chunks in however I could get them. You could probably fit them into a regular Dutch oven, but when you add the potatoes and onions later, you’ll want it deeper. I set the dutch oven, covered, on and under the coals. It was a pretty windy day, so I had to keep the side fire going and add more coals to the oven about every 15-20 minutes. I had planned on about a 3 hour cook time. Occasionally, I would check on the ribs, but not very often. After about 2 hours, I started preparing the rest of the items. I made the barbecue sauce first. This, also, was improvised. I used molasses instead of sugar and balsamic vinegar as well as mustard and lemon juice for the acid. It really gave it a dark look and great tanginess. If you like yours sweeter, use more sugar. For more heat, add more chili powder or tabasco. Add, stir, taste. Then, I cubed up the potatoes and the onions. In retrospect, some sliced or diced green/red peppers would have been nice to add as well. 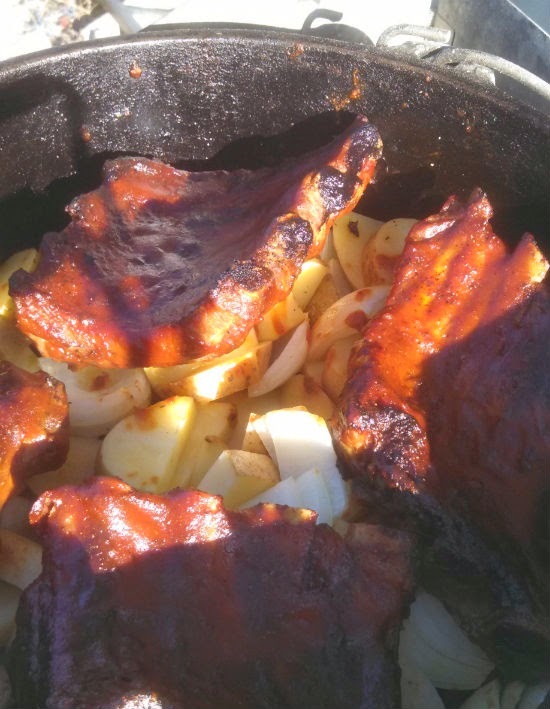 Out at the Dutch oven, I pulled the ribs out and tossed in the potatoes and onions. Those got stirred up to mix, and to break up the onions a little. Then, I restacked the ribs on top of the potatoes. With a silicon basting brush, I coated one side of the meat with a very thick, liberal layer of sauce, then using tongs, flipped them over and coated the other side. I put the lid back on and replenished the coals. After about another 15-20 minutes, I opened it up again, and I could see the sauce baking onto the ribs. It really looked GREAT! I slathered on another layer of sauce, turned them over, and did the same to the other side. I made sure to drizzle more sauce over the onions and potatoes, too. I closed it up and replenished the heat again. Finally, by the third time, I could see that they were about ready. I pulled it all in, and we set the table.Just before serving, I put another coat of sauce on. The rendered fat from the ribs had done a nice job browning and crisping the potatoes, and the bold flavors of the rub and the sauce on the ribs was amazing. It just doesn’t get better than this!